Do you belong to a lot of social networks and if so, are you familiar with each and every one? I’m going to be honest; I am not. When I say familiar, I mean knowing how to access different pages/groups/communities, utilize features, share information effectively, find people, send invites, start discussions, etc. Even more important, knowing things like the terms and conditions, guidelines, and requirements for specific aspects of these networks. Don’t get me wrong, there are social networks I am definitely more familiar with than others and, some I know so well I could practically offer courses to teach them. Then there are those few I am either new to or haven’t had a minute to sit down and learn the ins and outs of. One of the networks I am less familiar with is Google+. Yes I can share a link, respond to a post, or add a person to my circles but that’s about it. And although I’ve accepted invites to a variety of communities, I am still learning about them. 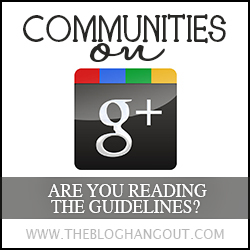 More specifically those communities can and usually do contain guidelines. It was just yesterday I shared a blog post about something completely unrelated to a community and then happened to stumble upon the ABOUT THIS COMMUNITY box that contained GUIDELINES. It was a little mortifying to discover considering this wasn’t my first offense. I had been sharing unrelated blog posts for quite some time. It’s especially easy to do if the Community name is vague or includes a broad range of categories like “discussions”. In my opinion, almost any topic/link/image can be considered the start of a discussion. So if you are guilty of the same offense don’t beat yourself up too much. 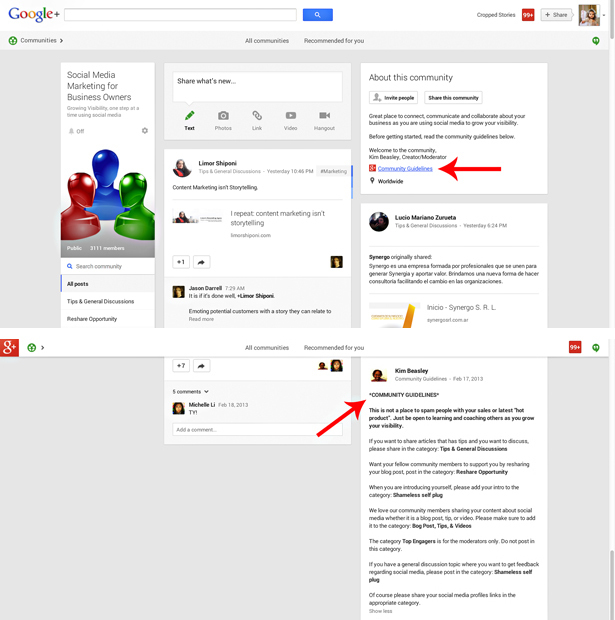 Moving forward, however, I’d recommend familiarizing yourself with them (a great post to check out: How You can be a Great Google Plus Community Member). If you are like me and not sure where to find such information, I’m here to help! With that said, today I’m going to show you how to access your communities to review information such as a description, guidelines, and categories. First, open your profile page. See the Profile text at the top left hand corner of your page? Take your mouse and hover over it. It will open a menu. If you scroll about half way down the menu, you’ll see Communities. Go ahead and click on that so the Community page will open. Once open you will see pending invitations for communities you haven’t accepted an invite to (if any), a collection of Communities you are already a member of, and lastly Communities that Google+ recommends for you (a nice bonus). Feel free to refer to my screen shots. Okay, now let’s open up one of those Communities and check them out! Guidelines may be found in different places on each Community’s page so I recommend taking a few minutes to look around. 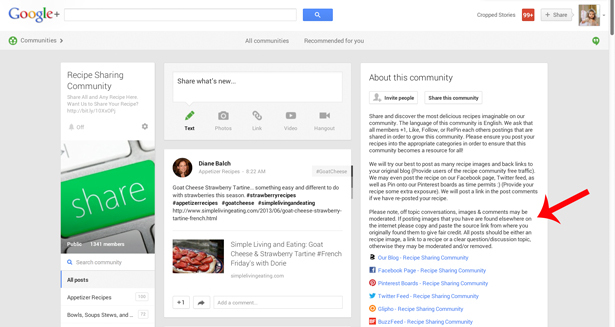 For example my Recipe Sharing Community contains it’s guidelines right in the About this community box. You will see from my screen shot they are NOT titled as guidelines, which in my opinion can easily be overlooked. That’s why it’s important to read the About this community in it’s entirety. “Please note off topic conversations, images, & comments may be moderated. If posting images that you have found elsewhere on the internet please copy and paste the source link from where you originally found them to give fair credit. All posts should be either a recipe image, a link to a recipe, or a clear question/discussion topic, otherwise they may be moderated and/or removed”. In my Writer’s Discussion Group Community, guidelines are contained in the post menu to the left of the page. In my Social Media Marketing for Business Owners Community, guidelines (while provided under the About this community box) are contained in a separate link. When I clicked on the link, I didn’t find anything immediately. It just opened up a collection of different posts. It was only when I began scrolling I found a post titled *COMMUNITY GUIDELINES* at the very bottom of the page. Under the About this community box, you will see the options to invite people or share the community. Looking for something specific in one of your Communities? No problem. To the left of the page you will see a search community option that allows you to search posts by category. To the left of the Community page, you will see an option to turn On or Off notifications. This controls whether you receive emails when someone shares a new post. 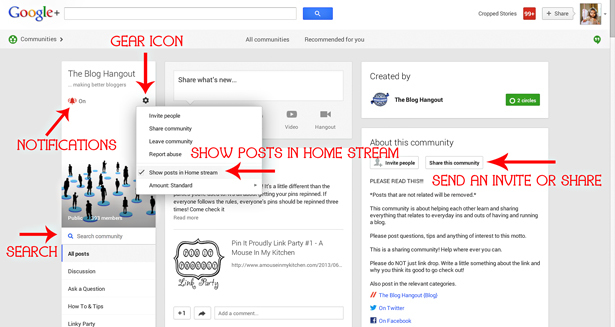 To have posts show up in your home stream, you’ll need to click on the gear icon (on the same line as your notifications) and make sure that the Show posts in Home stream box is checked. Okay, that’s it, that’s all I have for you today. 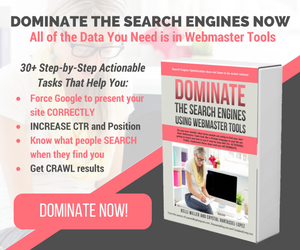 Hopefully you found this post helpful! If you missed our previous post, Linkin’ with my Ladies Thursday Hop, I hope you’ll check it out and link up! We’d love to have you! 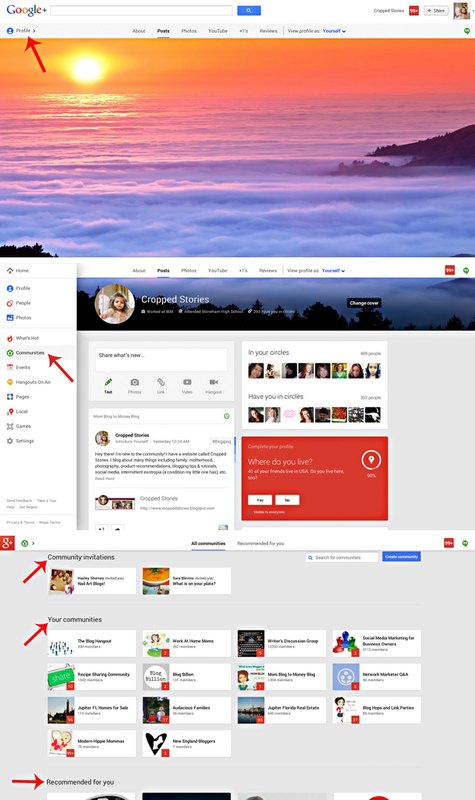 I still try to adapt with G+. This is very useful. 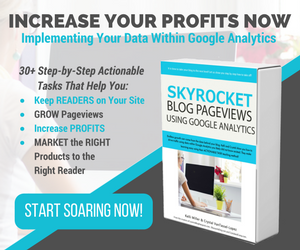 Bookmarked! Very good; glad I could help :o) Hope you’re having a wonderful Wednesday! Excellent post! 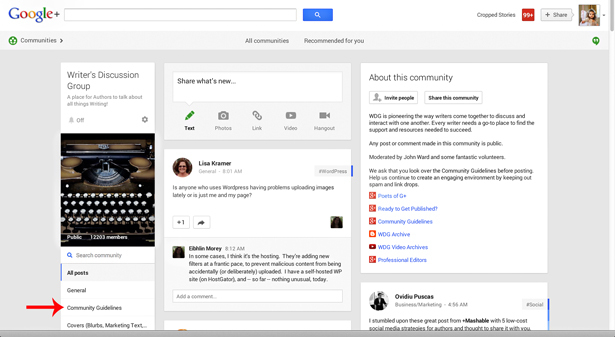 You may remember me as the one who loves “school supplies” and colours of the rainbow; we have interacted on Google+ . I think everyone should read the guidelines for their communities. You should get a lot of hits with this post, too! Of course I remember you ;o) Thanks for stopping by; appreciate it! Glad you liked this post! Hope you have a fabulous Tuesday! Thanks, Elena, I won’t tell anyone that you and I are kindred spirits who love office supplies, either! This was VERY helpful to me. I hope to use it regularly and that it will be a beneficial way to communicate with my volunteer board. Oh good, I’m glad you found it useful :o) Thanks so much for stoppin’ by and I hope you have a fabulous Monday! Frantic Mama is following you from the Happy Kids Inc Bloglovin’ Blog Hop! Thanks for your tips. I already like you on FB! I’m so glad you stopped by and found this helpful! I’ll have to check out your fb page :o) Hope you have a great night!